Slant bin shelving allows you to streamline productivity in kitting and picking processes with its easy organization and access. While small parts are difficult to store and organize, the bins keep everything in its place to prevent loss and pilfering, making inventory counts easier and faster. Since the shelves are slanted downwards, stored inventory remains at the front of the bin for easy identification. Employees don’t need to pull out every individual bin in search of needed items since the sloped design keeps bin contents visible at all times. This also means that users don’t need to bend down or stand on their toes while searching through the bins, which can lead to strain, fatigue, and injury. Countless adults already have varying degrees of chronic back injuries—every little thing that can be done to mitigate pain quickly adds up to a more comfortable working environment, and your employees will appreciate it. With easier access, users can also retrieve items in less time. This makes the slant bin shelving great for storing small parts at picking stations in addition to medical supplies and electronic parts. Choose from a variety of shelving sizes depending on your needs, whether your picking station is large or small. You can also purchase double-sided units for multiple picking stations in a small footprint. You can also add optional casters to these double-sided units for a transportable solution. 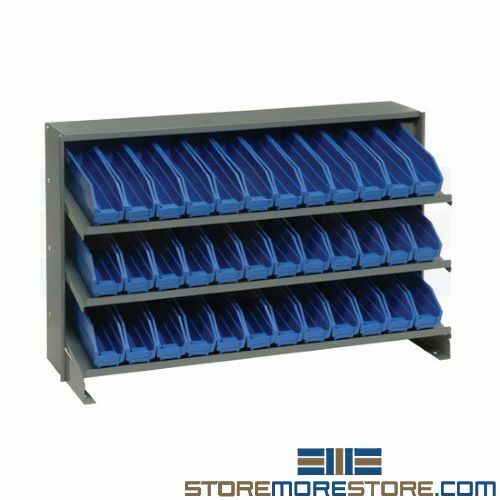 The slant bin shelving is available with or without bin systems in multiple colors and sizes. 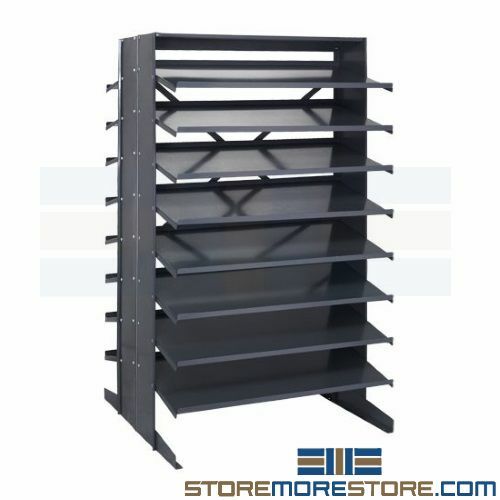 Slant bin shelving is available to buy online and ships within 10-15 business days. Free dock-to-dock shipping included. If you need any assistance or just want some help picking the right solution for you, please call us at 1-855-786-7667.